Every producer with sound musical IQ knows that for House music to work, you need to get the chords and loops right in your music. VIPZONE SAMPLES not only realizes that but also has this one of a kind pack to prove the point. No House music is easy to produce, especially with the puzzlements of the loops and the mind boggles of the chords. However Superchords Vol. 2 puts this worry away; the pack content is a summation of 55 midi chords, completely easy to use and 550 pumping pads wav loops to back up the chord performance. 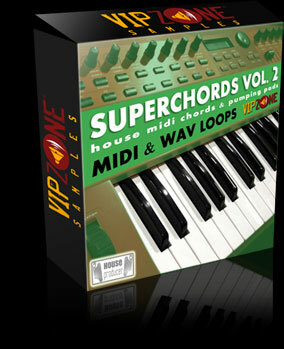 VIPZONE SAMPLES has already tried and tested all loops and pump pads and have organized all these wav and midi files for easy selection for anyone using them. Every loop and pad has been formulated by top end equipment like the Yamaha Motif XS to add some energy to sounds. Superchords Vol. 2 is a 1.2 GB array of classy loops and pads that add luster to your house music. With this great capacity you have an infinite number of ways to throw a midi chord here and a pump pad there and achieve astronomical success with every track that hits the club or the record labels. VIPZONE SAMPLES don't give any complications with the pack; just careful selection of the best loops and pads from a huge collection of top notch wav files. You stand a chance of going commercial with your tracks just when you settle that last coin of purchase. The royalty free advantage is what every producer needs for economical production of House music with chords and pumping pad flavors. And that just about sums up the fun you can have with Superchords Vol. 2. The features have lesser words to them but great impacts with every track you complete in your production. All chords are easy to use and don't need a genius to work with them. An adequate knowledge with musical chords is just fine. Quality is not a worry; wav tools see to that. If you want an idea of this great product before purchase you can download the demo.